Test Drive a Classic Mustang Cobra—Done! Remember Gus, my dear VW Beetle that I wrote about in “Farewell, Gus“? He was named after the roly-poly mouse who was a good friend of Cinderella in Disney’s movie. Of course Cinderella didn’t marry Gus; she married Prince Charming. Not many of us are as lucky as she. I loved and “married” Gus, but he was a wonderful friend, not my Prince Charming. Back in the late 60s and 70s, Ford Mustangs were my favorite car. Punch Bugs were cute, but Mustangs were long, angular, and sleek. The one in our town that I spotted most often was turquoise blue, and like all of them had that ever so cool engine roar. Fast forward to the 1990s. Along the route we walked every day from home to the elementary school was parked THE MOST BEAUTIFUL red Cobra convertible. Even when I wasn’t heading to school to meet the kids, I walked past this car when I could. Prince Charming. Nothing more to be said! 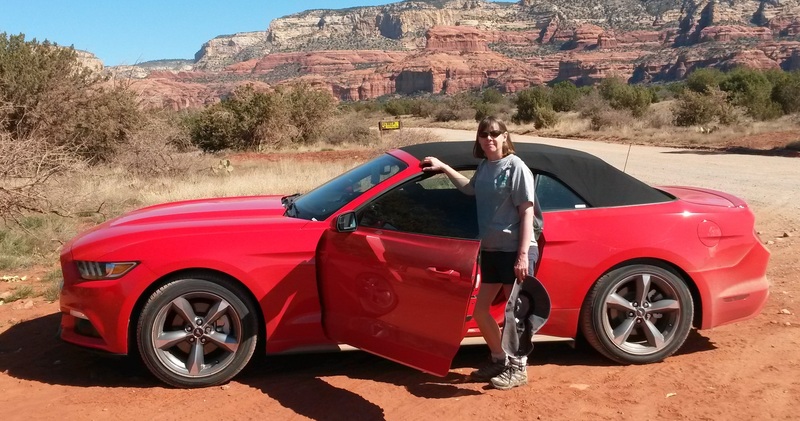 Thus, I put “test drive a classic Mustang Cobra” on my bucket list, and a few weeks ago I got the chance to do it. I continuously check the sale sites online for 1998 or 1999 Cobras, and one finally came up in Ohio right along the route I take to get to my mother’s house in West Virginia. Even though the car was black rather than red, I knew this was my chance. The salesman was laid back about my taking it for a test drive—all by myself! Being just five miles from I-70, I was very tempted to take it on the highway and tempt a speeding ticket. Luckily for my driving record, the car turned out to have an extremely stiff clutch pedal, so whereas driving at speed didn’t terrify me, the thought of not being able to clutch in an emergency situation did, so I only drove it six or seven miles. That was enough, however, to experience the power, the roar, and the feeling of being the cool driver of an extremely cool car. Ahhh! The engine roar! That great big hood to look past! The automatic opener to put the top down! The power! It had enough of that even though this was the base model and not the top of the line Cobra like the one I had test-driven. Mid-day temperatures at 8,000 feet up at the Grand Canyon were warm enough to drive top-down; a couple thousand feet lower in Sedona we had more convertible time; and by the time we got back to Phoenix we were driving with the top down from morning to night. Ever so sweet. Now back to searching now and then for that red 1998 Cobra convertible. “A dream is a wish your heart makes,” Cinderella sang. Chances are slim that I’ll ever actually buy one, but it is good to dream. Previous Article Previous Article: Pick a Random Novel—Done!